The lawyers and attorneys at National Injury Help are now accepting cases of gadolinium deposition disease (GDD) poisoning. MRI dyes currently used in enhanced MRI exams have been linked to a condition called deposition disease. The basis of these new gadolinium lawsuits is the failure of the manufactures to warn about the possible health risks. 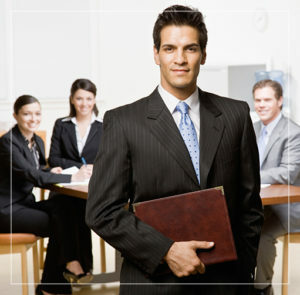 There may be substantial cash awards from claims and settlements in these cases. It was previously thought in the medical community that Gadolinium Deposition Disease is uncommon, however recent studies show this may not be the case. Gadolinium-related diagnosis for patients with normal renal function did not exist up until recently. What is Gadolinium Deposition Disease or Gadolinium Storage Condition? Gadolinium is a whitish rare earth metal discovered in 1880 by Jean Charles de Marignac. It has, by nature fluorescent properties. It’s these properties that are sought after for use in the medical world, mostly for the use in magnetic resonance imaging. Many currently used MRI contrast agents in America contain some level of gadolinium. Generally speaking most of the time gadolinium use over the years has proved safe in MRIs. To answer the question of what is gadolinium deposition disease, (also called Gadolinium Storage Condition) we pulled current information from the Radiological Society of North America for some answers. New research from the Mayo Clinic has found the potential for gadolinium residue to remain in the brains of people who have undergone multiple contrast-enhanced MRI exams. According to Emanuel Kanal, M.D., director of magnetic resonance services and professor of radiology and neuroradiology at the University of Pittsburgh Medical Center. “We now have clear evidence that the administration of various gadolinium-based contrast agents results in notably varied levels of accumulation of residual gadolinium in the brain”. “Integral to the safety of gadolinium contrast agents is the persistence of the gadolinium-chelate bond for as long as the agent remains within the patient”. The study published in the journal Radiology, strongly suggests that some types of contrast dyes used in magnetic resonance imaging (MRI) exams may in fact remain in the brain for years. Though long term effects of this gadolinium residue is not fully understood. What are the symptoms of gadolinium deposition disease (GDD)? “In their article, the authors focus on GDD, a condition in which patients with normal renal function develop a variety of symptoms. European-origin Caucasian women more are more susceptible to developing GDD. The authors believe that patients with GDD develop an immunologic response that is dependent on the genetic susceptibility of an individual. Symptoms include bone pane, skin and subcutaneous tissue burning pain, and various intensities of what is described as “chemo brain” or “brain fog.” Progressive thickening and discoloration of the skin and subcutaneous tissue of the distal arms and legs can occur in late stage disease. Symptoms of GDD occur within hours to days of gadolinium-based contrast agent administration. The authors believe that GDD may be a blend of a polypeptide-mediated response with a cell-mediated subacute adverse event. They suggest that a patient with GDD may have a genetic abnormality in metabolizing heavy metals. What are the brands of Gadolinium Contrast Dyes? All of the following brands of contrast dyes contain some level or formulation of gadolinium. 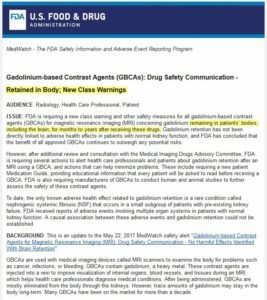 Gadolinium-based Contrast Agents (GBCAs): Drug Safety Communication – Retained in Body; New Class Warnings. However, after additional review and consultation with the Medical Imaging Drugs Advisory Committee, FDA is requiring several actions to alert health care professionals and patients about gadolinium retention after an MRI using a GBCA, and actions that can help minimize problems. These include requiring a new patient Medication Guide, providing educational information that every patient will be asked to read before receiving a GBCA. FDA is also requiring manufacturers of GBCAs to conduct human and animal studies to further assess the safety of these contrast agents. To date, the only known adverse health effect related to gadolinium retention is a rare condition called nephrogenic systemic fibrosis (NSF) that occurs in a small subgroup of patients with pre-existing kidney failure. FDA received reports of adverse events involving multiple organ systems in patients with normal kidney function. A causal association between these adverse events and gadolinium retention could not be established. BACKGROUND: This is an update to the May 22, 2017 MedWatch safety alert “Gadolinium-based Contrast Agents for Magnetic Resonance Imaging (MRI): Drug Safety Communication – No Harmful Effects Identified With Brain Retention“. There are two types of GBCAs based on their chemical structures: linear and macrocyclic (see Table 1 in Drug Safety Communication). Linear GBCAs result in more retention and retention for a longer time than macrocyclic GBCAs. Gadolinium levels remaining in the body are higher after administration of Omniscan (gadodiamide) or OptiMARK (gadoversetamide) than after Eovist (gadoxetate disodium), Magnevist (gadopentetate dimeglumine), or MultiHance (gadobenate dimeglumine). Gadolinium levels in the body are lowest after administration of Dotarem (gadoterate meglumine), Gadavist (gadobutrol), and ProHance (gadoteridol); the gadolinium levels are also similar across these agents. RECOMMENDATION: Health care professionals should consider the retention characteristics of each agent when choosing a GBCA for patients who may be at higher risk for gadolinium retention (see Table 1 listing GBCAs). These patients include those requiring multiple lifetime doses, pregnant women, children, and patients with inflammatory conditions. Minimize repeated GBCA imaging studies when possible, particularly closely spaced MRI studies. However, do not avoid or defer necessary GBCA MRI scans. Gadolinium lawsuit brought by Chuck Norris – says MRI chemical poisoned wife. It was back in 2005 when law firms across the U.S. began looking at the problems of gadolinium use in MRIs. In one case the plaintiff, Paul Decker, had an MRI and was given a dose of commonly used gadolinium called Omniscan. During that procedure Mr. Decker was also suffering from kidney failure. It was alleged that this triggered the condition known as Nephrogenic Systemic Fibrosis (NSF). The Sixth Circuit of the U.S. Court of Appeals affirmed a $5,000,000 dollar award to him. Do I qualify to file a Gadolinium deposition disease lawsuit? Brain fog or “chemo brain” symptoms. Intense bone or joint pain. Discoloration in the lower arm or leg. Feel free to call us directly at 1-800-214-1010 or use the contact form below, it costs nothing and you could receive a substantial cash award for your pain and suffering. How much can you get from a gadolinium lawsuit? I got brain fog or burning skin from gadolinium, can I sue? How much compensation would I get from a gadolinium lawsuit? How much are the settlement amounts in the gadolinium lawsuits? The answer to these questions can be difficult to predict, as the gadolinium class action or MDL for this hasn’t started yet. There is still time for join in this gadolinium lawsuit, but there are statutes of limitations that apply. As you can see above one verdict in 2005 netted $5,000,000. Some of the past defective drug lawsuits have had millions of dollars in a compensation fund, and then that is divided up between all who have joined the lawsuit. Example: $50,000,000 in a settlement fund that would serve 1,000 victims would be $50,000 per person. This is only an example and does not represent what may happen for gadolinium. Gadolinium Deposition Disease Lawsuit Claims & Settlements | Contrast Dye MRI page updated on December 11, 2018.